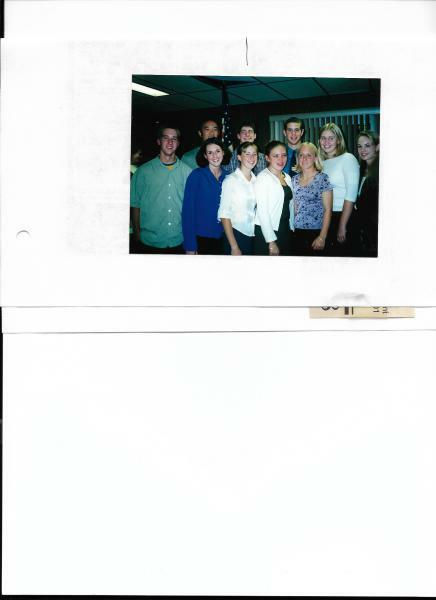 A joint meeting was held on June 9, 1996 to install the officers for 1996 to 1997. The 40& 8 and the 8 and 40 installed the incoming officers Commander: Ron Reed 1st Vice Joe Chance 2nd Vice Terry Hodges Adjutant Bob Sterle Finance officer Dan Raymond Sgt@ Arms Don Rooker Service Officer Duane Falor Executive Officers: Gene Rooker George Feldpausch Jim Dayton Auxiliary Officers: President: Lisa Bartlett 1st Vice Audre' Bartlett 2nd Vice Anne..
A joint meeting was held to install the Legion & Auxiliary officers for 1996-1997 year. The Forty and eight and the Eight & forty installed were the installing officers. Commader: Jim Dayton 1st Vice Jim DeLine 2nd Vice Barb Long Adjutant Bob Sterle Finance Dan Raymond Chaplian Don Rooker Service Officer; Duane Falor Sgt@ Arm Bill Cole Exec Officers: Gene Rooker Carl Galvin Ron Reed AUXILIARY OFFICERS President: Virginia "Ginny" Balgoyen 1st Vice Audre' Bartlett..
A joint meeting was held to install the incoming officers of the Legion and Auxiliary. The 40 & 8 and 8 and 40 were the installing officers. The Auxiliary served a luncheon after the installation. Commander: Jim Dayton 1st Vice Barb Long 2nd Vice Darren Dayton Adjutant Herm Koos Finance Officer Dan Raymond Chaplain Don Rooker Sgt @ Arms George Feldpausch Service Officer Duane Falor Executive Officer Don Rooker Carl Galvin Rod Reed Auxiliary: President..
American Legion and Auxiliary host a dinner to honor the participants of Boys and Girls State program held in June. Girl State participants were Sarah Shaver, Shelly Dorn, Besty Twitchell, Erica Walsh. Boys Staters were James Hull, JOhn Gentilozzi, Blake Nasif & Robert Winstanley. Nathan LaCross attended AL student trooper school. 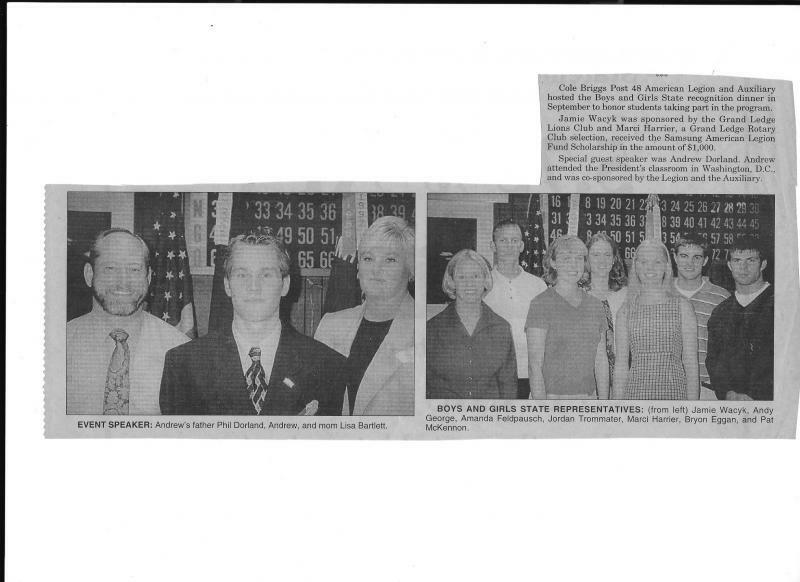 Besty Twitchell was elected to Girls Nation while attended Girls State. Besty attended Girls Nation and while there meet President Clinton and Vice President..
American Legion celebrates their birthday with a dinner, awards, speakers and cake. Al Balgoygen received a Certificate of Appreciation for all his help this year. Ginny Balgoygen received the Lois Lawrence Volunteer of the year Award. Past President & Past Commanders were honored at the dinner. Stormie Utterbach won the Auxiliary's essay contest. Entrants were asked to write and essay on "What the American Flag Means to Me." She collected a cash prize and a..
A joint meeting was held to install the incoming officers, installed by the 40& 8 and 8 & 40. Commander Dan Raymond 1st Vice Bob Sterle 2nd Vice Barb Long Adjutant Herm Koos Finance Officer Gene Rooker Chaplain Al Balgoyen Sgt@ Arms Don Rooker Service Office Duane Falor Executive Officers: Jim Dayton Carl Bartlett Ron Reed Auxiliary: President Ginny Balgoyen 1st Vice Audre' Bartlett 2nd Vice Jody Strickland Sec'y Marian Kleinfelt Treas Marilyn St Germain..
Post48 American Legion and Auxiliary host the annual Boys & Girls State Dinner honoring student that participated in the programs. Girls State students were: Jamie Wacyk, Amanda Feldpausch, Jordan Trommater & Marci Harrier. 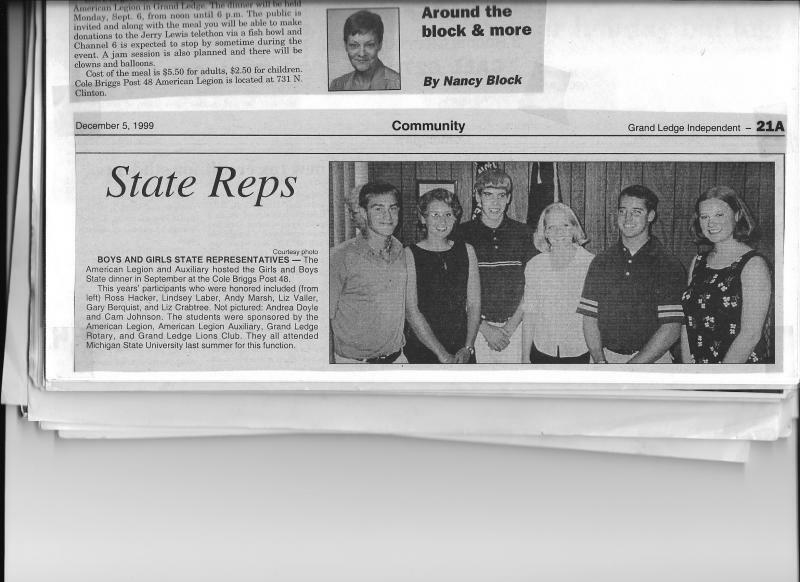 Boys State Students were: Andy George, Bryon Eggan & Pat McKennon. Marci Harrier received the Samsung American Legion Fund Scholarship in the amount of $1,000.00. The Legion and Auxiliary also sponsored Andrew Dorland's trip to Washington DC to the President's Classroom. 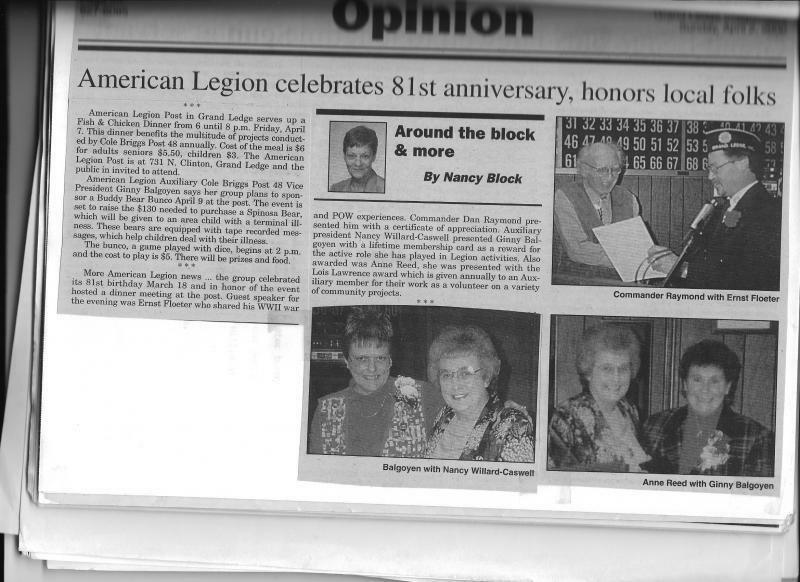 The American Legion's 80th Birthday Dinner was held March 13. Guest speaker, Dean Brandon, gave a history of the Michigan Militia. The Auxiliary gave certificates of Appreciation to Robert Bartlett, David Bartlett, Carl Bartlett and Walter Pierson. The Lois Lawrence Volunteer of the Year was given to Audre' Bartlett. The Auxiliary presented the Cole-Briggs Post with a birthday present of $300.00 for the building fund and $400 to go toward the purchase of a dishwasher. 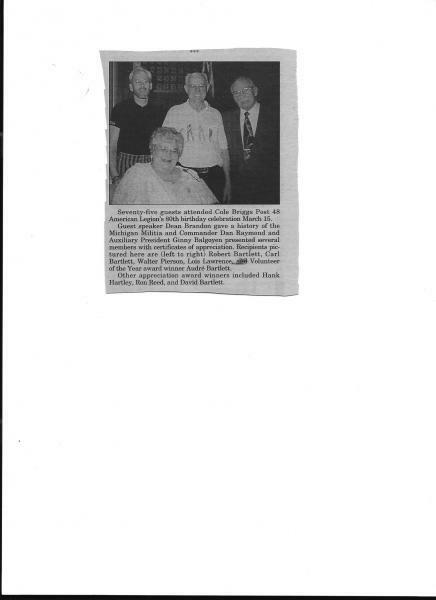 A Joint meeting was held on June 23, 1999 to install the 1999-2000 officers, the 40 & 8 and 8 and 40 were the installing officers. Commander Dan Raymond 1st Vice Bob Sterle 2nd Vice Bruce Rainey Adjutant Herm Koos Finance Officer Gene Rooker Chaplain Al Balgoyen Sgt @ Arm Richard Cupp Service Office Don Rooker Executive Office: Carl Galvin Carl Bartlett Ron Reed Auxiliary: President: Nancy Willard 1st Vice Ginny Balgoyen 2nd Vice Sueann.. The American Legion & Auxiliary start the year with a labor day Chicken Bar-b-Que. We collected $1,185 and gave $600 to the Jerry Lewis Telethon for muscular dystrophy, that balance when in the joint Legion/Auxiliary food fund to support the other dinner we have for the year. (Legion Birthday dinner and Boys & Girls dinner there are both free dinners to all members and there families. Auxiliary member Ann Reed dressed up like a clown..
American Legion and Auxiliary host the Boys and Girls state dinner, this years participants were for Boys State Ross Hacker, Andy Marsh, Gary Berquist & Cam Johnson, Girls State: Lindsey Laber, Liz Valler, Liz Crabtree and Andrea Doyle. The Students were sponsored by the American Legion, American Legion Auxiliary, Grand Ledge Rotary and Grand Ledge Lions Club. The Legion Lovelies are making a return engagement. This group of dedicated entertainers put on a show at the Legion on Saturday February 19. The debut of this group of talented Legionnaires last year was a real "hoot". This years Lovelies were impersonating entertainers like Gypsy Rose Lee, Shania Twain, Dolly Parton, and many other. Post 48 Celebrates it's 81st birthday and in honor of the event hosted a dinner and dance at the post. Guest speaker for the evening was Ernst Floeter ( he was a Germany soldier held in the USA as a POW during the War) who shared his WWII war and POW experiences, he was presented with a certificate of appreciation. Auxiliary President Nancy Willard presented Ginny Balgoyen with a lifetime Membership card as a reward..
Legion and Auxiliary Officers were installed for the upcoming year, Legion was installed by the 40 & 8 and Auxiliary was installed by 8 and 40. The Auxiliary served a luncheon after the installation. Commander Don Rooker 1st Vice Bridget Rondy 2nd Vice Bruce Rainey Adjutant Herm Koos Finance Officer Gene Rooker Chaplain Carl Galvin Sgt @ Arms Richard Cupp Auxiliary: President Nancy Willard 1St Vice Lisa Bartlett 2nd Vice Kara Bond Sec'y Sharon Jones.. Ten Grand Ledge High School students participated in Boys & Girls State. The Legion and Auxiliary along with Grand Ledge Rotary and Grand Ledge Lions all sponsor these youth people in this program. This years students were, Boys State: Chad Beson, Casey Christman, Erik Simon, Collin O'Keefe, Girls State : Rose Shaver, Katie Kentner, Amanda Minich, Kars Farquar, Melissa Wright and Meghan McDowell. 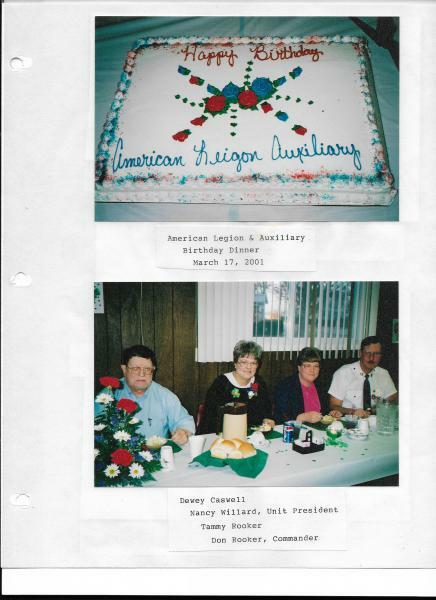 The Legion and Auxiliary celebration there birthday with a dinner, awards and cakes. Commander gave Carl Bartlett a lifetime membership award, for all his years of service, (I think we had to call him out of the kitchen to give him the award). Carl Galvin was given a Certificate of Appreciation for his years of service. 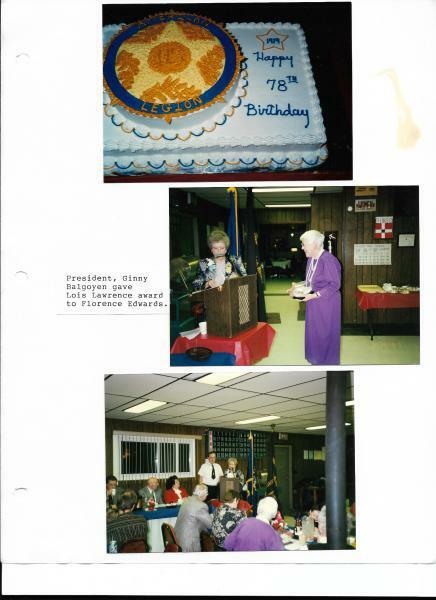 Nancy Block a local reporter for the Grand Ledge Independent was given a Certificate of Appreciation for all the..
Florence Edwards joined the Auxiliary when she was 3 years old, she was 4 time past president, she first served as President in 1944 at the age of 23. She was still active in the Auxiliary until she passed away in 2001. At the time of her death she was a member of the Auxiliary for 77 continues years. A memorial donation of $1,025.00 was made in her name to Meal on Wheels. A annual..